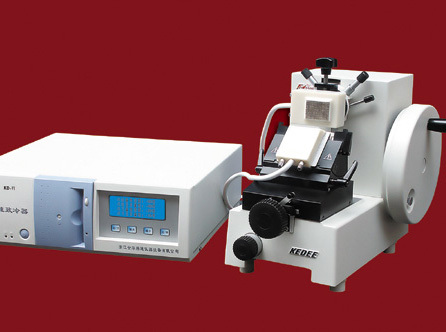 KEDEE Histopathology instruments are widely used in the hospital at all levels, medical and life science division, agricultural and forestry institute, epidemic prevention center, veterinary center, public security and legal medical experts office, scientific research institute and laboratory etc. Compatible Embedding Material: Paraffin, Plastic. Range of the thickness of slice: 0.25 - 60 μm. Range of the thickness of trimming: 0.25 - 60 μm. 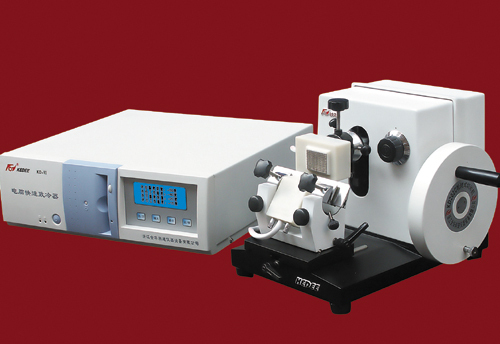 Setting thickness of slice ranges: 0.25-1 μm increment 0.25 μm 1-10 μm increment 1 μm 10-20 μm increment 2 μm 20-60 μm increment 5 μm. Specimen Horizontal feeding: 28 mm. Stroke Length: 58 mm. Disposable Blade Index: Low profile blades. 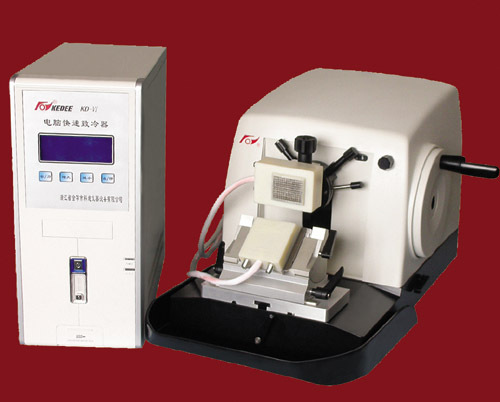 Retractable specimen clamp, auto feed cutoff: with alarm. Lateral knife holder. Maximum area of cryo-plate: 45 x 40 mm. The best angle between cryo-plate and cryo-probe: 60 degree. 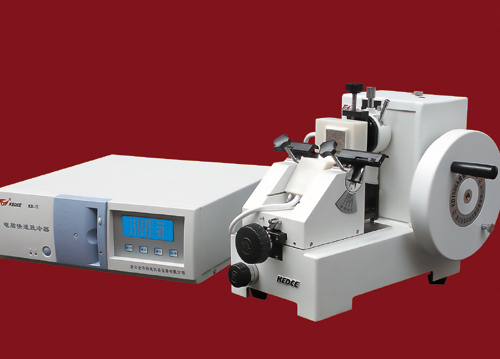 Dimension and weight: KD-3358 microtome: Length x Width x Height: 520 x 430 x 330 mm, 24 kg. KD-VI freezing mainframe: Length x Width x Height: 420 x 190 x 410 mm, 8 kg. high-power semiconductor temperature different freezing. LCD panel indicating setting temperature, current temperature. precise mechanical drive with stability performance and great-efficiency. Hand-wheel can lock at any position. Range of the thickness of slice: 1 - 60 μm. Range of the thickness of trimming: 1-60 μm. 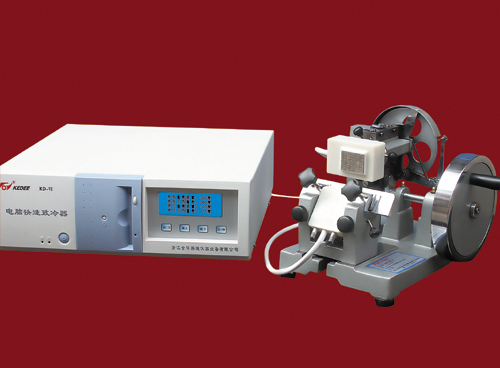 Specimen Horizontal feeding: 28 mm. Maximum section of slice: 55 x 50 mm. Maximum area of cryo-plate: 45x40mm. 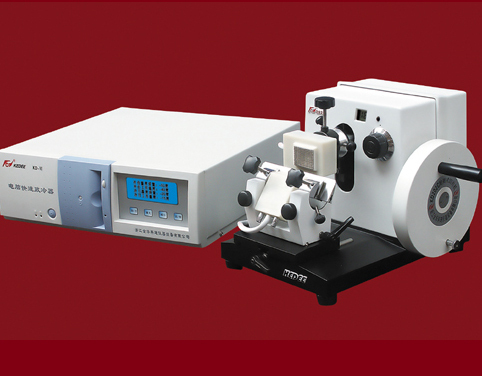 Dimension and weight: KD-2258 microtome: Length x Width x Height: 500 x 460 x 300 mm, 23.3 kg. 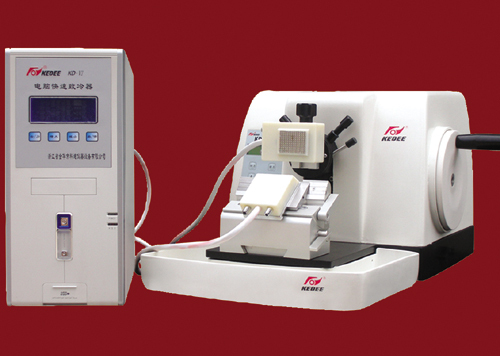 KD-VI freezing mainframe: Length x Width x Height: 420 x 190 x 410 mm, 8 kg. mechanical drive with stability performance and great-efficiency. Range of the thickness of slice: 1-35 μm. Minimum setting thickness of slice: 1 μm. Maximum section of slice: 60x40 mm. Steel-knife holder and disposable-blade holder are available. Maximum area of cryo-plate: 45x40 mm. Range of the thickness of slice: 1-35 μm (Reproducible slices). Maximum section of slice: 50x40 mm. Maximum section of slice: 60 x 40 mm. Range of the thickness of slice: 1-25 μm (Reproducible slices). Maximum section of slice: 40x30 mm. Range of the thickness of slice: 1 - 25 μm (Reproducible slices). Range of the thickness of slice: 1-25 μm. > 25 μm setting any thickness for slice. 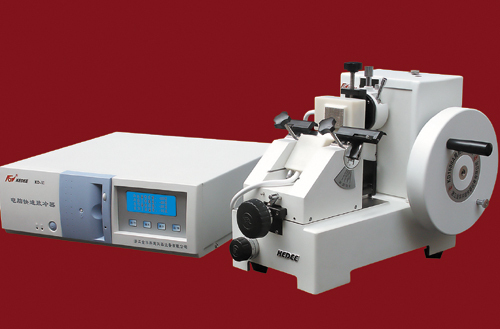 mechanical drive, evenly reproducible slice. Range of the thickness of slice: 1-25 μm. Maximum section of slice: 35x25 mm.